Cyclists in the City: It's not the cyclists cutting out motor traffic lanes at Tottenham Court Road. It's Boris's plan. But he's not offering you any alternatives either. Want to cycle down from Camden instead of driving? Forget it. It's not the cyclists cutting out motor traffic lanes at Tottenham Court Road. It's Boris's plan. But he's not offering you any alternatives either. Want to cycle down from Camden instead of driving? Forget it. Pictured above. the junction at the top of Tottenham Court Road. 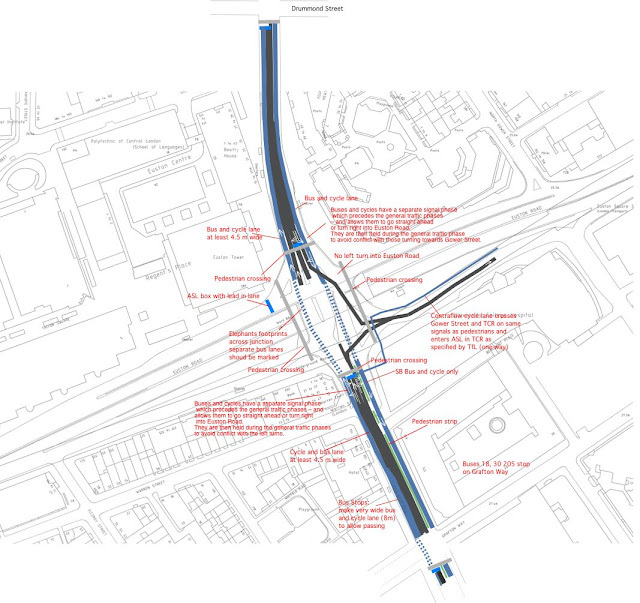 Transport for London is about to spend £10million redesigning this junction. The plan above, is the version designed by a bunch of people with bicycles over at Camden Cyclists. What TfL wants to do is something completely different. Something that will look amazing to designers but will be pretty much useless and downright inconvenient for most people. And probably downright dangerous for people on bikes. TfL wants to spend lots of money here to make less space for cars and buses. It will reduce 5-6 lanes at the top of Tottenham Court Road down to three. And it will squeeze in an advisory bike lane (in one direction only). You can see the detailed TfL plan here on this page. Not only do motor vehicles get less room but there's also nothing here for people on bikes. How on earth are you supposed to encourage people to cycle instead of paying for the bus or to park their cars in the centre of London, if you constantly 'forget' to include the cycling infrastructure? It's not even as if you'd need to spend any more money. Or as if you'd need to restrict any more lanes for cars. You're doing that already. You just need to actually add the bike lane bit. But here we go again. No bike infrastructure whatsoever. Transport for London has issued a consultation (good, at least there is a consultation this time) on its website which shows its own plan. You can add your comments on that plan and I'd encourage you to spend two minutes filling out the form. this. Fabulous. What a waste of effort. Once again, it's taken some keen cycling folk to point out what a complete waste of time and effort this latest TfL scheme is. The scheme proposed by the Camden Cyclists folk is actually designed for the people who live, work, walk, cycle and take the bus or drive here. It is designed to benefit people by making things work better so they can choose to use a bike rather than the bus (saves them time and money) or they can choose to bike rather than drive (also saves them time and money). But this scheme does nothing for anyone. I'm sure the TfL plan looks lovely on the desk of an architect. But it's no good if you're on the bus. And it's not going to encourage you to swap a short car trip (51% of London car journeys under two miles, remember) down from Camden or Kentish Town. They're just shafting (pardon my French) the motorist and doing pretty much nothing to allow you to cycle instead. I'm fed up of poring over Transport for London plans. That's not my job. It's their job to design London for Londoners. But what they're doing is designing Londoners out of London in favour of drawings that look lovely on paper and are a right pig for everyone who has to use them. Thanks Boris. We all pay for Transport for London through the top-up tax you charge us on our council tax. Time you started telling your team (who report directly to you, remember) to start taking Londoners seriously when it comes to the roads you control. If all of this groaning hasn't put you off, comments please to the poor folk at Transport for London who are going to get caught in the middle of this. Click here to open the online comment form. Good post, as ever. Whatever it is that you're pouring over TfL plans, Danny, I hope it's flammable. Well in Danny. I have submitted a response along very similar lines. Your comments about plans looking great on paper, really hit the mark. I read a long article in a lighting magazine this week, talking about the brilliant new 'shared space' of exhibition road. Ha! Load of guff about how the lighting enabled pedestrians and cyclists to dominate the space over cars. Lots of pretty pics, but we are beginning to see the reality. Keep up the good work! 1. Transport for London: Don't forget that TfL only have direct control over 5% of London's roads, albeit the big ones with the hairy junctions. You have to remember the role of the Boroughs as well and work on them. Of course, if a Borough does happen to show an interest in a scheme which reduces motor vehicle capacity, they are liable to get TfL complaining about it. 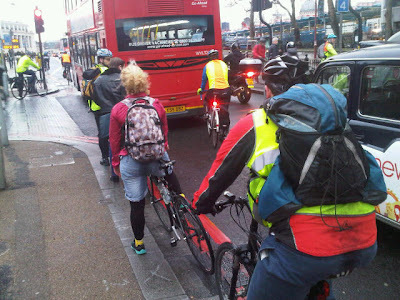 why does camden cyclists' design mix up bus and cycle traffic? there's enough space in this junction to separate the two. and playing hopscotch with buses is still intimidating to cyclists, even with wide lanes. camden cyclists are wonderful and dedicated campaigners, but i wonder if they are still thinking in an infrastructure model that's ten or fifteen years out of date? thoughts? I agree, sharing with buses is far from ideal. And if you're hoping to achieve the level of cycling that cities like Copenhagen enjoy, that is far from practical. Many cyclists can block a bus, and buses take up the lane. They are also 10x the size of bikes. this proposal does of course make you despair. Some of our shoddy local schemes are positively cycle friendly compared to this. Tfl is meant to lead on quality. but I don't think you identified the right problem in the reducing space argument. Of course the currently vast expanse of lanes has to be reduced in favour of places for people. What tfl have completely missed are the big opportunities: 2 way access to tottenham court rd (buses and bikes), slimming down the junction and getting rid of the tunnel.